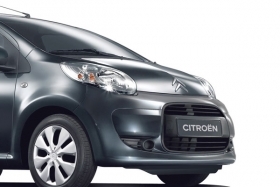 PSA's new three-cylinder engine could go in cars such as the Citroen C1 (shown). PSA/Peugeot-Citroen said it plans to invest 175 million euros ($238,000) over the next two years to build turbocharged versions of its new low-emission, three-cylinder gasoline engine family. PSA will build 320,000 units of a new 1.2-liter turbocharged three-cylinder engine annually in Douvrin, northern France, starting in 2012. The French automaker has already said it will produce 640,000 naturally aspirated versions of the three-cylinder engine in Tremery, eastern France, also starting in 2012. Those engines will have 1.0- and 1-2-liter displacements. The Douvrin engine factory is a joint venture with Renault. It opened in 1969 and last year produced 1.3 million engines, including 942,000 units for PSA. PSA has not said which cars will get the new three-cylinder engines, but industry insiders expect the powerplants to go in cars such as the Peugeot 107 and Citroen C1 minicars, Citroen C2 and C3 small cars, and Citroen C4 and Peugeot 308 subcompacts. PSA CEO Philippe Varin said in a statement that the new engines will help the company to continue to be a leader in producing low-carbon vehicles.